Learning English is full of fun and joy! Experience it! In order to equip the students with the future challenge of English curriculum, our school invited some outstanding graduates in Teaching English as a Second Language (TESL) from McGill University to serve as English tutors during the summer vacation. The NETs organized different kinds of activities like role playing games, sketches for junior form students and examination oriented practices for senior form students. They not only had fun with our friendly and professional tutors, their confidence towards the use of English is also greatly enhanced through the program. Our NET and English teachers organized various school based activities increasing students’ interest towards English. Every week, an English speaking day is held increasing exposure towards the language through pronunciation and intonation practices, English speech and vocabulary activities. 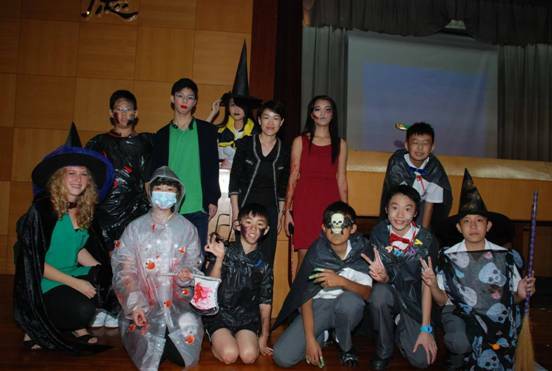 In addition, she organized many interesting after school activities in our newly refurbished English activity room like movie viewing, speaking games. All these make English learning not boring to our students anymore. In recent years, we have developed an academic link with McGill University (21st in the world from QS World University Rankings 2013). 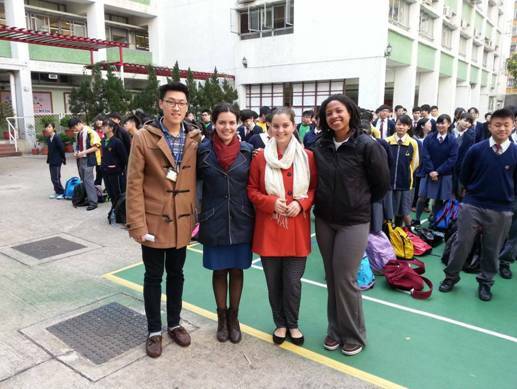 Four student teachers who are native speakers of English undertake teaching practice. On one hand, our school helps nurture the future teachers. On the other hand, the local English teachers are also able to understand some new theories of English language teaching. 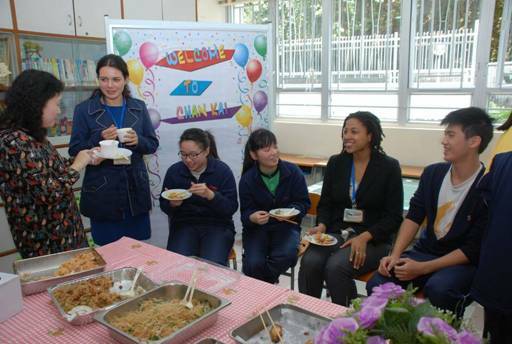 In addition to normal class teaching, Canadian festival introducing the food, culture and sports was also organized. Our students benefit a lot from this internship program. In recent years, our school has successfully applied for getting funding on English Enhancement Scheme (EES) and Refined English Enhancement Scheme (REES). The earlier one put emphasis on improving English teaching methodology and students’ learning motivation in English lessons. The latter is more related to cross-curricular collaboration with other academic departments like Chemistry, Biology, Liberal Studies and History. Both teachers and students reaction towards the various programmes held are very positive and encouraging. It also paves the way for the development of tailor made teaching and learning materials for our students. Our McGill University student teachers had a nice chat with students. Our student teachers have just shared their experience in Canada with students in morning assembly. Our students learnt how to make pancakes with our NET, Miss Gold. Our students had Rugby game with our NET. 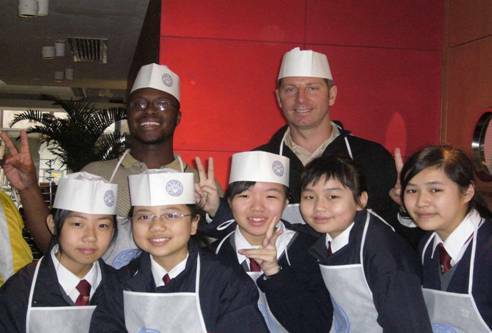 Sometimes, Learning English outside the classroom has lots of fun! Through activities organized during Canadian Festival, our students’ horizon is widened. They know more about western culture. 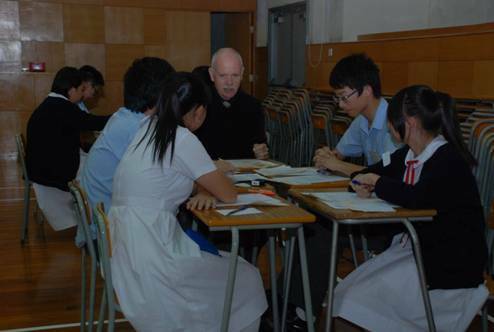 Our Secondary One students attended McGill Teachers’ English lessons during summer vacation. Learning English is always fun. Our S1 students had a great time learning how to make Pizza. Is it scary? Our Halloween Fashion Show!!! Our school organizes joint school oral practices every year. Our English magazine-a great platform for our students to practise English writing skills.